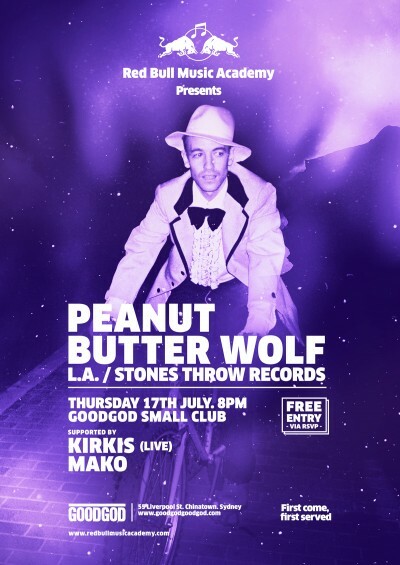 Twelve months after kicking off with original NWA member Arabian Prince, the Red Bull Music Academy’s monthly Club Night series celebrates its first anniversary with DJ/producer Peanut Butter Wolf at the controls. The Stones Throw Records head honcho has been bringing cutting-edge hip-hop and assorted leftfield curiosities to the world since 1996. While the man born Chris Manak launched the label so he and MC Charizma could release their now classic debut LP, he’s since introduced future stars Aloe Blacc, Mayer Hawthorne, Madlib, J Dilla, J Rocc and more over the course of 200 releases. Key releases over the past 12 months include Snoop Dogg’s return to form alongside Dâm-Funk as 7 Days Of Funk, and The Stepkids’ second LP of psychedelic soul. He’ll be joined by rising Melbourne producer Kirkis in live mode, as well as Sydney’s Mako. It’s free via RSVP, make sure you register here.